How many errors can you find in the Parkiteer map? Parkiteer is a good programme… from my observations, more and more people are using it for secure bike parking at stations. But how many errors can you spot in this bike cage map that has been appearing in MX for the past few weeks? Below the map the logos of the organisations running Parkiteer are shown. Bicycle Network Victoria runs the show, but the Metro logo is also listed… I’m surprised they didn’t check the map of their train network was accurate. ← Previous Previous post: Should parking at Melbourne railway stations be free? Next → Next post: Going solar – when should I jump, and how many panels? I think we deserve a Caulfield station on the Sandringham line, too! I think it shows that they did absolutely no proof-reading of the map. This kind of rubbish wouldn’t make it past the technical editor at my workplace, and we only write reports that will be read by the people who commissioned them – we don’t publish posters for millions to see! They may as well have put all the stations on one big circle. That map is useless. I would’ve liked to have seen the “Frankston / Stony Point” line. Have a bloody good weekend everyone. That map is so piss-weak, I can only conclude that it was never intended to actually be a map at all, but merely some kind of figurative semblance of one. 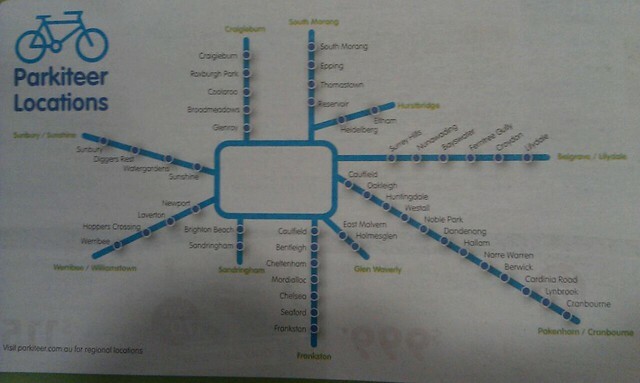 Also they have combined stations on the Belgrave and Lilydale lines into one ‘line’ which is most confusing. Ditto Cranbourne and Pakenham. But notice that the Sunbury line (is ‘Sunbury/Sunshine’) even though this is one line. 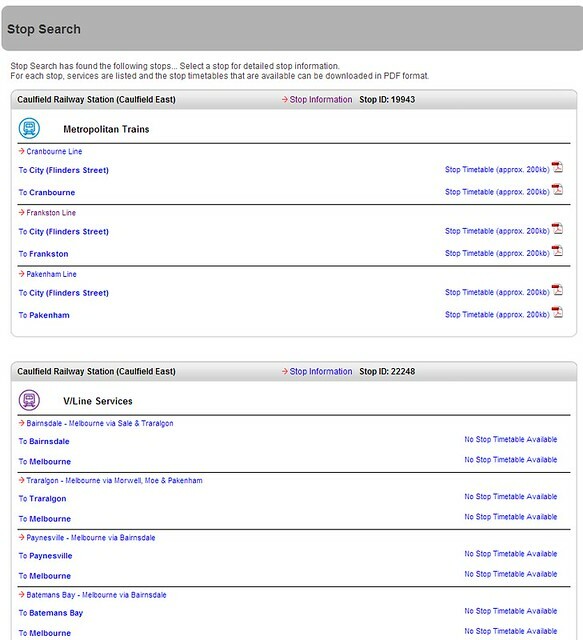 And the Werribee line is labelled ‘Werribee/Williamstown’ when there is no Parkiteers on the Williamstown line, and no mention of the Altona line. As for Glen Waverley, the yellow text appears to be the line name, not that Glen Waverley has a Parkiteer (see how Frankston is duplicated). It would be clearer if the line names were ‘Frankston Line’ . At the moment it appears that Hurstbridge has a Parkiteer. Sorry, Daniel, you’ve actually noted both my issues. Should reread the OP before I hit send! Why aren’t parkiteer cages marked on the standard PTV maps, like bus/tram interchanges and car parking?